ÖBB ordered 61 additional Vectron MS locomotives from Siemens Mobility, as part of the contract signed in January 2017 for the delivery of up to 200 Vectron locomotives. The locomotives will be built at Siemens Mobility’s factory in Munich-Allach, and deliveries will begin in March 2020. They will be operated by the Rail Cargo Group and are planned for cross-border freight service in several European countries. This now brings the total number of locomotives ordered to date to 108. The locomotives for ÖBB have a maximum output of 6.4 megawatts and a top speed of 160 km/h and are equipped with the required national train control systems as well as the European Train Control System (ETCS). “The fact that ÖBB is again calling an option from the standing framework contract confirms the reliability and performance of our Vectron platform. It provides sustainable value creation over the entire lifecycle, thus enabling our customer to make long-term plans for the future,” said Sabrina Soussan, CEO of Siemens Mobility. 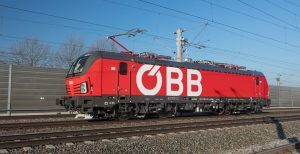 Under the contract signed in 2017, ÖBB ordered the supply of up to 100 alternating current (AC) locomotives, 50 alternating current (AC) locomotives with diesel power modules, and 50 multisystem (MS) locomotives.